Applying makeup on the dry skin is a complicated job. You should be careful while you choose the makeup items. Dry skin lacks the moisture content and so when you are selecting makeup products, you select the ones, which are water based. Avoid the powder-based stuff, as it will make your face look drier. - Exfoliate your skin at least once a week. By exfoliating the skin, dead dry skin cells, dirt and germs will be removed from the skin. For daily purpose, you should cleanse your face before starting to apply makeup. Face-wash or cleanser especially for dry skin are available in the market and should be used. - After cleansing your face it is important to moisturize your skin. A good brand moisturizer should be used to massage the face, neck and whole body. It is important to maintain the oil content of the skin. By applying moisturizer, the skin becomes soft and smooth. You can also select the one which can be used as sunscreen too. - After you have applied moisturizer, leave it for few minutes to settle down. Now the makeup items can be applied. Starting with the foundation, choose the one, which is liquid, based. Don’t go for powder or cream based ones, as they will leave patches on the skin. Also you should use a brush to apply foundation, don’t make use of your fingers. For shade selection, choose the shade, which is one tone lighter than your skin color. Make sure that you select the shades in a place that has proper lighting. - Next is the concealer. Apply concealer under the eyes and at other blemish areas. Use a liquid concealer and don’t overdo it. 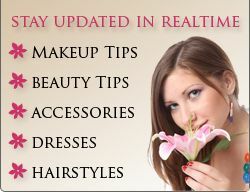 - For eye makeup, eye shadow should be selected which is cream based. The color and shade of eye shadow should be selected according to your preference. For eye liner you can either go for creamy one or liquid one. Black eye liner is universal color but you can go for other colors too. - Dry lips gets cracked easily. So, regular use of lip balms is recommended. For lipsticks avoid the ones which have matte effect as they will make lips drier. Instead, go for lip-gloss or liquid lipstick. They will stay there for whole day and will help to maintain the condition of the lips. - For blush, creamy blushes are recommended. Use of blush brush should be done to apply blush over the apples of the cheeks. Avoid the selection of powder based blush as they will add more dryness to the skin. Dry skin should be taken proper care of in winters especially as it gets more cracked and drier at that time. You can select the makeup items that are especially prepared for dry skin too. Avoid the makeup items, which will make the skin drier. Keep in mind the above tips while applying makeup and you will definitely look gorgeous.